An Office of the Inspector General audit regarding the NRC’s process for ensuring integrity in scientific research is now available here. The audit set out to determine if the NRC has the controls is place to assure that scientific research is objective, credible, and transparent. The NRC’s regulatory research program conducts research in the areas of nuclear reactors, nuclear materials, and radioactive waste. Scientific information that supports research includes factual inputs, data, models, analyses and technical information, or scientific assessments. This scientific information often informs NRC regulations. The OIG found that while the NRC has controls in place, the way it manages scientific information, including information associated with scientific research, needs to be strengthened. Specifically, the NRC must improve the internal controls associated with responding to public requests to correct scientific information and for designating it as influential scientific information. Additionally, the OIG audit states the NRC must adopt required guidelines on conducting peer review of its information products associated with scientific research. The audit also states the NRC must have effective controls in place to ensure that its information products are objective, credible, and transparent. Without effective controls, an opportunity for maximizing the quality, objectivity, utility, and integrity of NRC scientific information is being missed and may result in compromising stakeholder confidence in NRC’s ability to regulate in an unbiased, trustworthy, and open manner. The report makes five recommendations specific to the way the NRC handles scientific information, to ensure that the NRC adopts federal requirements on peer review, and to ensure that internal guidance that may be impacted by new or revised federal guidance is regularly reviewed to determine if revisions are necessary. What a pathetic waste of time, effort, and taxpayer money! When was the last time that substandard NRC scientific research threatened reactor or public safety?! Name one! 93 spent fuel pools in this country are overloaded making them prime terrorist targets. Near-misses occur at old nuclear power plants with increased frequency and what the hell is the OIG looking at-research! The NRC and the ACRS also spend more time reviewing future designs for new nuclear plants (that will never be built) than looking hard at improving the safety of existing nuclear power plants. The NRC and its OIG priorities are grossly out of whack! And when the OIG looks at anything it comes up with lame politically-correct recommendations that aren’t worth the matches to burn them up! Isn’t the NRC charged with first and foremost protecting public safety?! Get with your mission NRC and start putting public safety first! 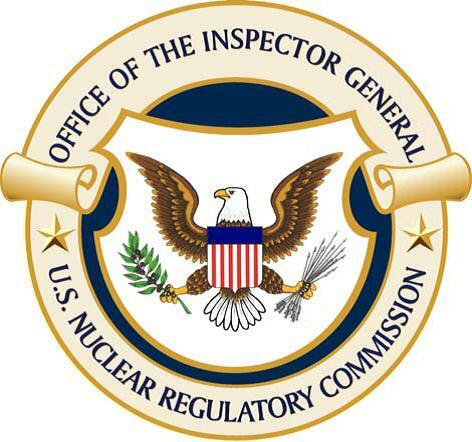 The OIG failed the publics trust when they downplayed what happened at San Onofre, since it was clear to many professionals that the NRC “still” lacks the technical expertise to critically review the design of replacement steam generators, depending far too often on the Utilities and their suppliers to provide documentation that is then rubber stamped by the NRC as “acceptable”. This lack of expertise nearly resulted in a nuclear incident and/or a nuclear accident that would have impacted all of southern California if not the entire Nation. I urge you to investigate the OIG and find out were the breakdown in communications occurred, so that it does not occur again, America is depending upon you to get it right every single time. Next Next post: Science 101 – What is Nuclear Fuel?